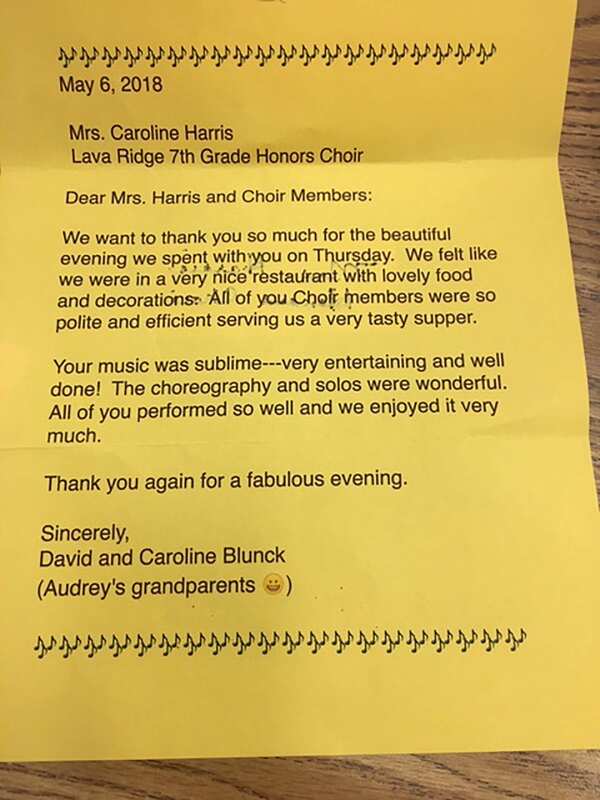 The 7th Grade Honors Choir program at Lava Ridge Intermediate School is quite unique. Community outreach and service are not just an important part of the program, they ARE the program. During the school year, the choir focuses on developing “7 Habits for Highly Effective Teens” (Sean Covey). This book teaches seven principles to guide students toward living a service-oriented life. (Please see attachment documents.) The summer before school starts, all the students read the book. Throughout the school year, the choir reviews and discusses the attributes of living a “7 Habits Life”. Early in the school year, students plan and complete acts of service for their peers, teachers, families, and community. These acts of service evolve into some wonderful connections and unexpected outcomes. Last year, some choir students lifted a teacher who had been having a difficult time, by surprising her with a basket of “sunshine”. The teacher’s emotional and heartfelt reaction showed the students how a simple act of kindness can be a tremendous boost for someone. The students serve on an individual, small group, and choir level and continue throughout the year. Not surprisingly, however, these students continue this pattern of service even after they finish choir. 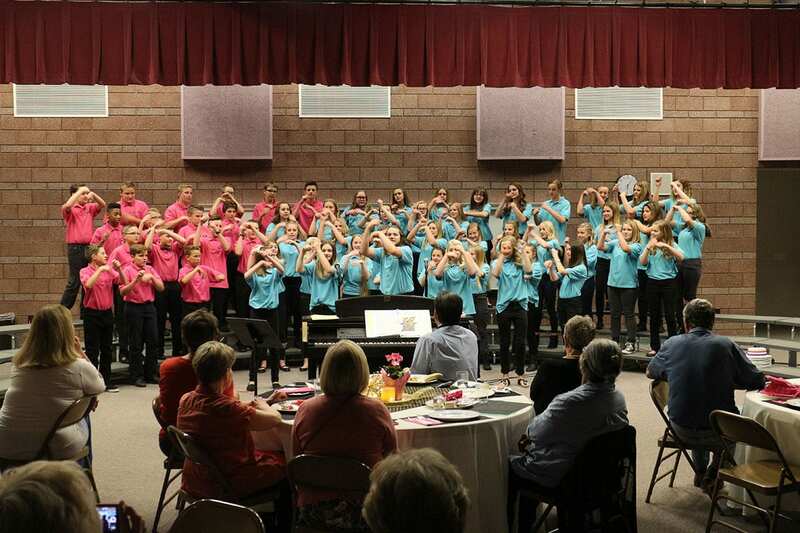 Because they have read, discussed, and implemented the seven habits consistently during their time in choir, it truly has become part of who they are. This is manifest in the activities the choir students choose to participate in throughout the year. The choir cannot participate in every event, so the students must choose which activities to be a part of. Even when faced with activities full of fun and food, the students instead choose to participate in events where they can be of most service. For example, at Christmastime, they choose to perform at a fundraiser sponsored by the local hospital, rather than attend a festival with fun activities. 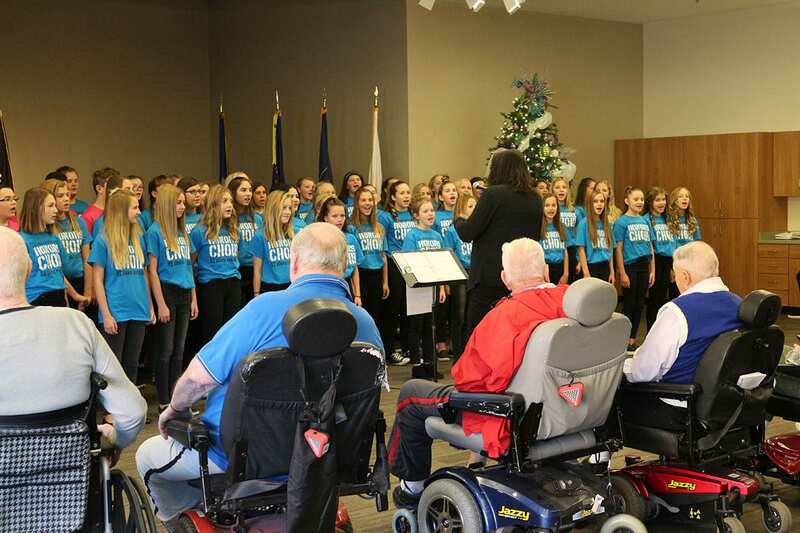 Further, when the students perform at the Veterans Home, they don’t just sing and leave. After the performance, they spend time with the residents. It is powerful to witness twelve-year-olds sitting with war veterans, listening to stories from their service in the war. The veterans love this time with the students, and the choir develops a deepened appreciation for the immense sacrifice these people have made. 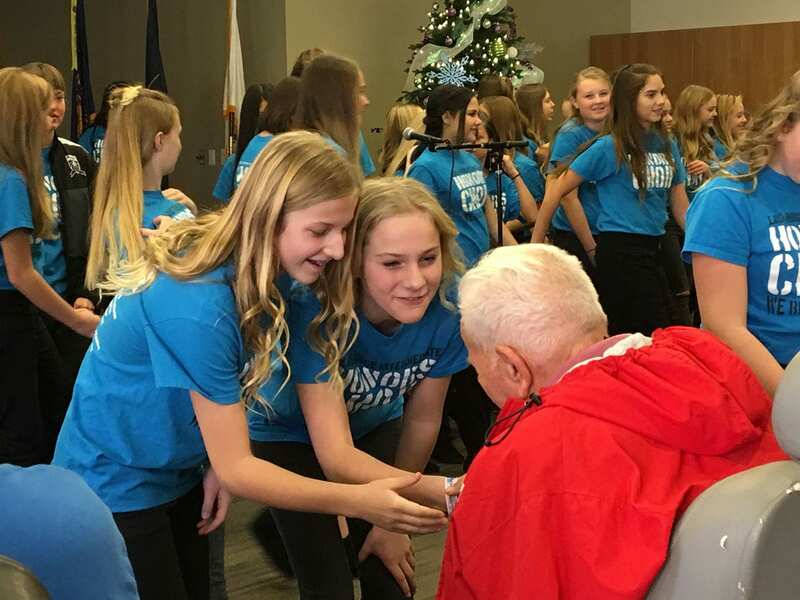 The choir also participates in an event called “Giving Back”, before which each student hand-delivers an invitation to a senior citizen and makes travel arrangements for him or her to attend. The students serve their guests dinner and perform while they eat. Afterward, they present written letters, expressing appreciation for how their guests have influenced their lives. The students and the seniors love this evening. The students eventually have the opportunity to reflect on all their choir experiences. When asked to write what they enjoyed most about being in Honors Choir, the overwhelming majority of the students choose acts of service they participated in. It is no question the students who finish this choir program go on to serve for the rest of their lives. This is an ongoing project, that involves not only the community as a whole but specifically the senior citizens. 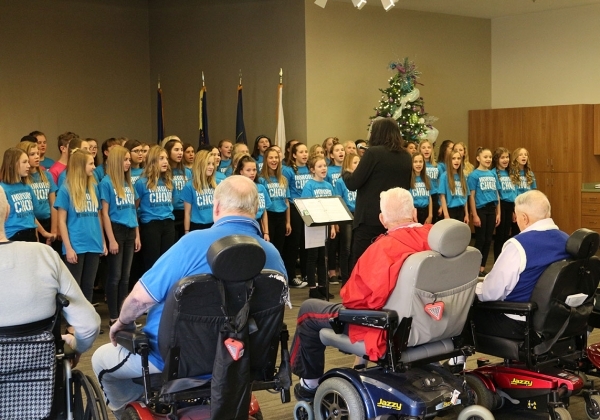 Throughout the year, 90 senior citizens (including residents from the Veterans Home) attended performances. In addition, other concerts were given throughout the area, including fundraising for the local hospital. In total, about 500 people attended small concerts. Our goal was not to necessarily perform for large numbers. The purpose was reaching the community one person at a time. June – August 2017 Students read “7 Habits of Highly Effective Teens” over the summer break. August 2017 Students start to learn repertoire that will be sung at the various events throughout the year. August – May 2017-2018 Students continue to learn repertoire for various performances. They are focusing on service and putting into action the 7 Habits. November 17, 2017 “Jubilee of Trees” – Performance. Fundraiser for the local hospital. December 12, 2017 – Choir tour to Southern Utah Veterans Home, Autumn Park Assisted Living, Stephen Wade Car Dealership. April 2nd – Parent meeting to discuss food, decorations, invitations for “Giving Back”. April 16th – Students deliver invitations to a senior guest. Make arrangements for transportation to and from school. May 3 – Students decorate and prepare for “Giving Back” evening. May 3 – “Giving Back” – Senior Citizen dinner and program. The Jubilee of Trees is a holiday tradition celebrated by thousands throughout Southern Utah while raising funds that support Dixie Regional Medical Center. My choir provided some of the entertainment for the event. The students loved singing Christmas music for this fundraiser and felt a great sense of value for helping out in a small way. The staff at the senior homes stated that the residents LOVED having my students come because of the interaction they had following the concert. Parent volunteers were used in implementing this program. They assisted the students in set up, clean up and preparation of the food. It was great to see the students working with their parents. Local businesses and the school PTA helped sponsor the program to pay for buses and food for the “Giving Back” evening. As previously said, these programs were not meant to be a grandiose event. The purpose was to reach the community one person at a time. As a choir director, I have received thank you notes, and many verbal thank yous from the various audience members. As well, my students also received thank yous. In following the “7 Habits of Highly Effective Teens” we felt we made a difference in many lives. As well, a parent of a former choir student was so impressed that we were still implementing the “7 Habits” program, he donated money to our cause. In years past, our goal was to go out and perform. However, I realized that the students needed a purpose besides just “getting out of school”. Hence, I introduced the “7 Habits of Highly Effective Teens” and more rigorously encouraged the idea of “service” in all we do. This has created a very powerful and heartwarming connection between my students and the senior citizens of our community. I knew the program was successful when the students were begging me to go back and sing to the senior citizens. To celebrate the success of our year, we could have taken a day from school to go to the local swimming pool or movie theater. But no, they wanted to go back and sing and interact with their new found friends. Several students continued to go back on their own, without the choir.